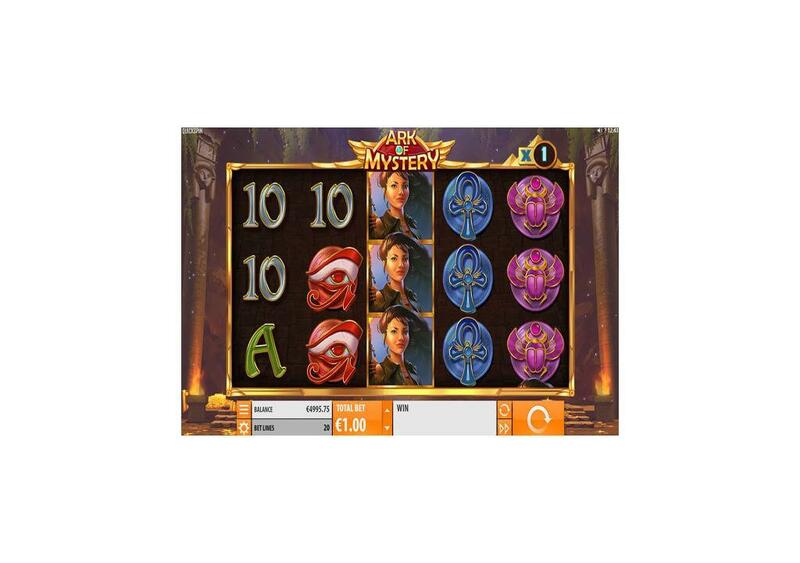 Ark of Mystery is the newest video slot machine by Quickspin that has five reels and hosts a total of twenty betting lines that you will place your stakes on during the gameplay. 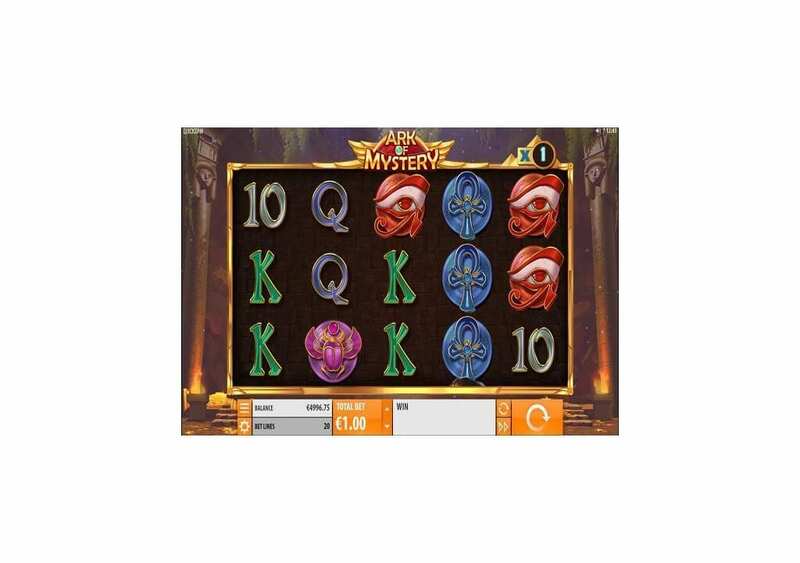 As the title of the online slot indicates, you are going to travel to Ancient Egypt as you try to locate the Egyptian Ark of Mystery for great rewards and fortunes. You will join a robust female Tomb Raider, Anna, during one of a kind ride. Ark of Mystery does not only offer you 20 lines, as it also comes packing plenty of features that you can activate along the way for massive rewards. 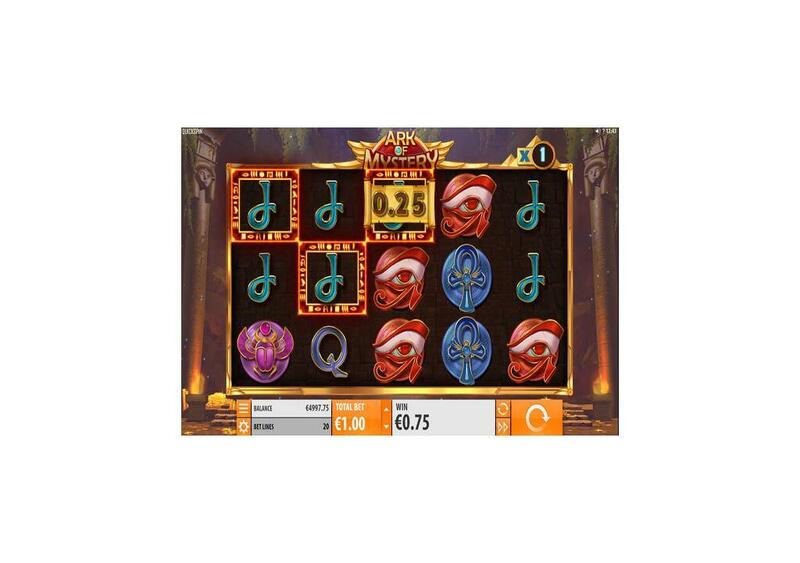 The Quickspin slot machine is playable across multiple devices and software systems, so you can expect to enjoy it on an Android Device, an iPhone, a tablet or a laptop. 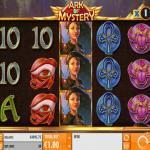 Ark of Mystery invites you to travel to the ruins of the temples of Ancient Egypt with the wild adventurer, Anna. You will do that while you spin the five reels of the slot machine and place bets on its 20 stake lines. You are going to locate the Ark of Mystery with the help of the heroine so you can earn a share of its fortunes and golden treasures. Ark of Mystery comes packing plenty of bonuses and features for you to take advantage of during the gameplay and they include re-spins, wilds, multiplier boosters and more. Play it here for free and check all that it has in store for you before you play it with real cash. Get ready to join Anna, the wild tomb raider and adventurer as you travel to the fantastic ruins of Ancient Egypt as you try to locate the Ark of Mystery to earn its mysteries and fortunes. 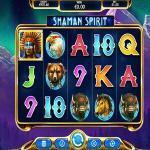 The slot machine is by Quickspin, which means that you will be able to enjoy a highly rewarding adventure that comes packing great visuals, animations, and an overall exciting journey. Also, it indicates that you can expect plenty of winning chances, thanks to the 20 lines it has, as well as the bonuses and features that it has to offer. 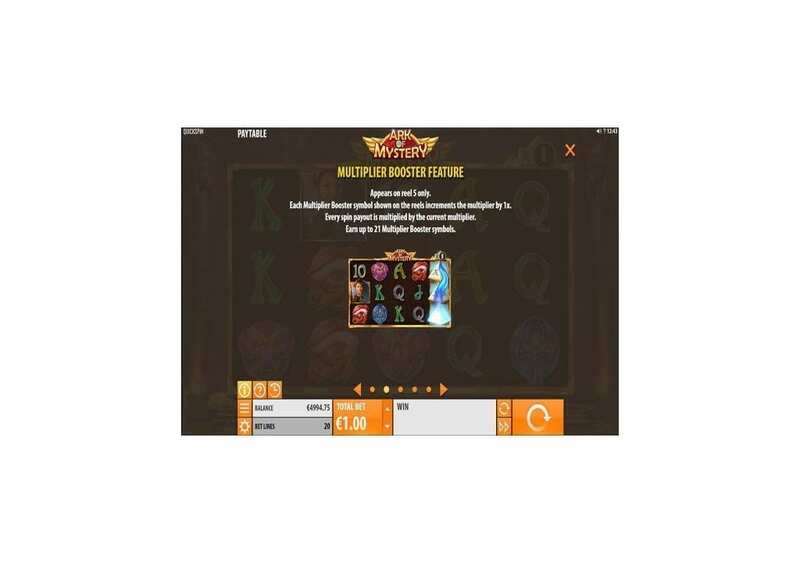 They include wilds, the Wild Ark Respin feature, multipliers, Booster symbols and more. 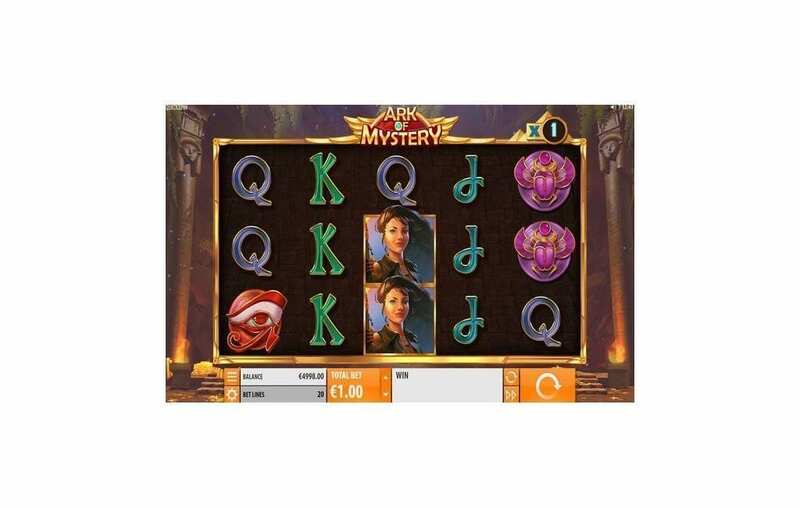 The online slot by Quickspin is playable across multiple devices, which is not a surprise since mobile gaming is popular nowadays, and for a game to be successful, it has to be playable on a multitude of devices. 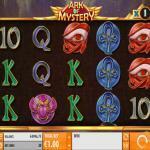 Therefore, you can enjoy Ark of Mystery on your Android Device, your iPhone, your Desktop and Windows Laptop. It is also playable here for fun, so you can see all that it has in store for you before you play it with real cash. 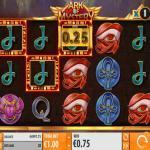 It is playable with stakes that vary between 0.20 and 100 credits for every round on the slot machine. Ancient Egypt is one of the most ancient civilizations in the world, the land of the pyramids, the pharaohs and the Nile, and the Pharaohs believed themselves to be gods. Ancient Egypt was also one of the wealthiest ancient civilization in the world, and this is why the pyramids, the temples and the ruins of Ancient Egypt have a lot of golden fortunes and treasures, and this is why many tomb raiders and relic hunters ventured to Egypt to earn their share of these fortunes and riches. 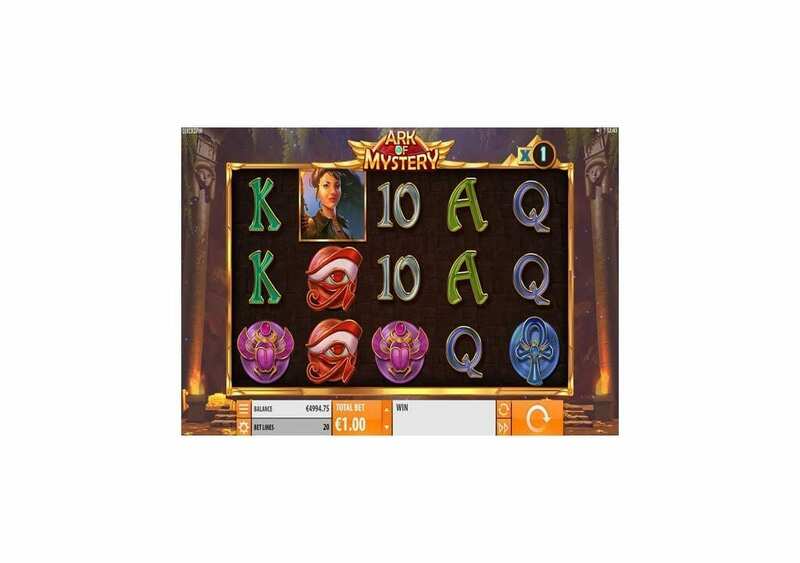 In this video slot machine by Quickspin, you are going to join Anna, the Relic Hunter in her adventure amongst the Ancient Egyptian ruins for a great ride that is full of rewards and fortunes. So get ready to join Anna as you travel to the ruins of Ancient Egypt for a one of a kind adventure. 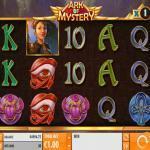 Ark of Mystery is a Quickspin video slot machine that has five reels with twenty-lines and three rows of symbols. 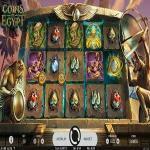 Since the slot machine takes place in the Ancient Egyptian ruins, you will see two big Ancient Egyptian columns on the two sides of the reels. The slot’s reels have a golden outline, and you will see two goblets of fire underneath each column. As for the Reels that will appear on the reels, they include the heroine and adventurer, Anna. They also include some of the golden fortunes and treasures of Ancient Egypt, the eye of Horus, the sacred scarab, the Ankh, a treasure chest, and poker card symbols. You will see the orange control panel of the slot machine where you can control the gameplay, place stakes, spin the reels, view the paytable and more. The online slot machine by Quickspin has an RTP of 96.53%, which is a good percentage if you put it in comparison with most online slots, whether by Quickspin or other developers. You can claim a line prize when you get three matching symbols at least on the same line, starting from the leftmost reel. The image that is going to result in the highest reward is none other than the Heroine, Anna. She can give you an award that can amount up to 5000 credits when you place the maximum bet and get 5x Anna symbols on the same paylines. 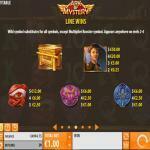 You can view all of the different prizes and features of the slot through the paytable. Ark of Mystery does not have a shortage when it comes to features and bonuses. It has Boosters, wilds, multipliers, and re-spins. The wild symbol of Ark of Mystery comes in the form of the Wild Ark. It can replace other symbols appearing on the reels, to help create the best pay out. It can only land on reels 2, three and 4 to help develop payouts. If you get the Wild Ark symbols on reels two, three and four at the same time, you are going to trigger a re-spin. At the beginning of the re-spin, these Wild Arks can expand to cover other open spaces in adjacent reels, and this way, you can continue triggering more re-spins. You can claim from 2 up to 6 re-spins. 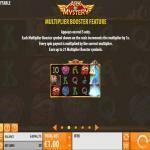 Multiplier Boosters can appear on the 5th reel, and it is going to multiply your winnings, with up to a 21x multiplier.